What's the best way to let someone know you're nuts about them? Give them a gift of unrivaled gourmet nuts. Roasted pistachios and almonds, jumbo cashews, and premium pecans arrive in a rustic, beautifully stained wooden tray with a "Nut'n But Love for You" message. 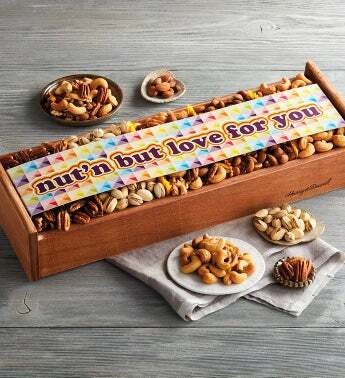 Both the fun message and the delicious nuts are sure to make any nut lover smile.